Material: Made out of thick square MS Pipe frame with glass shelves. 1. made out of thick square ms pipe frame. 2. distance between shelves to shelves is 16. 3. size of each shelf is 48 x 18. 4. platform surface will be of 3mm thick. - Fabricated out of aluminium square pipe or angle fitted with sturdy castor wheel for smooth shifting movement of the unit. - Shelves are made of wooden with aluimnium clad or frosted glass. - Each shelves has been provided with four fluorescent tubes of 4’ size. main ON-OFF switch. A terminal block to connect rack to 220volts AC. Our rich knowledge in this domain has betrothed our enterprise to meet the market requirements with a highly durable range of Tissue Culture Rack. Made of heavy duty Mild Steel pipe and powder coated each shelf size 1200 x 400mm and distance between each shelf is 400mm top of shelf shall be made of nylon sheet. Each shelf is fitted with 4 nos. 40 watts fluorescent light. Nylon wheels provided for easy movement without any scratch on the floor with Photoporiodic time and 3, 4 and 5 U V light in each unit. 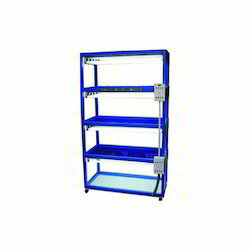 Technical Specifications:- TC Racks are designed keeping in mind the application research or commercial production. 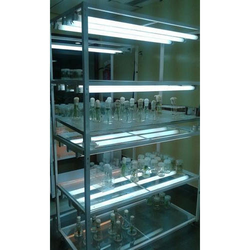 We are offering Tissue Culture Rack to our clients.